The initial plan for my home garden was to set up an automated drip irrigation system, but as my garden evolved, I realized how difficult it would be to make that type of setup work for me. Drip systems work best on gardens that have lots of individual shrubs and plants, and I have the sort of garden that might kindly be called “chaotic”, given that I test new plants each year, do odd experiments, and have a fondness for those charming-but-never-in-the-same-place-twice biennials. It’s not the type of garden that I’d design for a client, but as my fellow designers pointed out recently, our home gardens are often more like testing grounds than finished landscapes. So yeah, while drip systems are lovely, it’s really tough to water a gardener’s garden with one, because of how often things change. That’s where sprinklers like the Dramm ColorStorm Turret Sprinkler come in. I turn it on for half an hour, everything gets a good soaking, and it doesn’t matter that I don’t recall where I sowed the poppy seeds. They come up and do their thing regardless. Of course, whenever you turn a sprinkler on, you have to remember to turn it off again, and that’s where I’ve had issues in the past. Before Dramm sent me one of their ColorStorm timers, I’d set up the sprinkler with every intention of turning it off again, but then I’d get a phone call, the UPS man would arrive, and one of my employees would ask me to meet them at a jobsite. All the while, my sprinkler’s doing its thing, wasting water and annoying my plants with excess. Not cool. 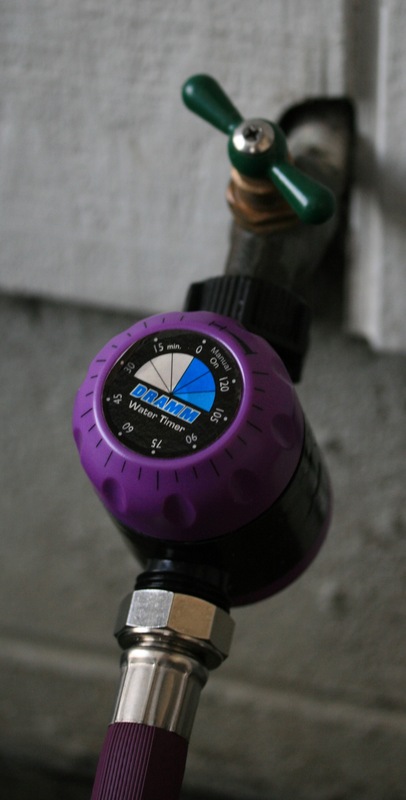 With this Dramm timer, you turn the dial to however many minutes you’d like to water, it counts down and then shuts off the water at the right time. It’s not automated, so it’s not for people who are mad forgetful – it’s for people like me who can remember that they want to go out and water, but then sometimes get distracted midway through. And thank goodness, it doesn’t run on a battery, so it’s both eco-friendly and lazy person-friendly. It’s like an egg timer where you wind it to the right time and the mechanics inside take care of the rest. Will the timer last forever? I don’t know. It’s got a lot of plastic parts. But it’s only about $15, and both the sprinkler and the timer are backed by a lifetime guarantee as long as you’re using them normally and not letting your rottweiler chew them. Mine’s been working great for the few months I’ve been testing it – no leaks. Anyway, back to the turret sprinkler: it’s really the best I’ve seen. I mean, it’s purple, so that’s a point in its favor, but I can promise you I’ve chucked a lot of purple tools over the years that didn’t perform. What I love about it is that it has an adjustable dial to let you choose the shape you’re sprinkling in! How cool is that? If I am watering my lettuce bed, which is rectangular, I can choose the rectangle shape. Or if I’m watering my curved garden bed, I can choose the half-circle pattern so I don’t dampen my fence but do hit all of my perennials. Because the base is made of metal, it’s not going to crack over time, and like the other Dramm tools I’ve owned over the years, it seems built to last. The only innovation I wish Dramm would make is to come up with a tripod for their sprinklers so that I could elevate them above all that healthy foliage! Obviously that’s pretty easy to do yourself – a large brick set on its end works – but I’d love to be able to buy a purple tripod with a stand at the top so I could set the sprinkler at the right height. Hopefully that’s next in the product lineup (or am I the only person who would buy that?). Giveaway! Since these two products are a natural fit to use together, Dramm has generously offered to send one of you lucky readers a set of your own. To enter, just leave a comment saying which color you’d like for your new Turret Sprinkler and ColorStorm Timer (red, orange, yellow, green, blue or purple), and I’ll choose a winner at random next Wednesday the 27th. US only. EDIT: Julia won! Congrats, Julia. Please pick me—PLEASE! PURPLE PLEASE……. Would love to try the orange, can always use a new watering timer! Red please! Thanks for the opportunity at another giveaway! As queen of the blond gardeners, I challenge the purple set to prove it is doofus proof. 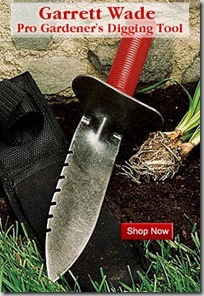 This product seems a gift from the gardening gods for my dilapidated memory. Blue, please, pretty please. Purple please! Boy do I need one of these (and is it only me or does it seem like everyone like purple these days? 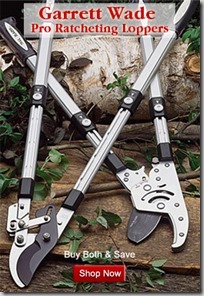 Wish more people would make garden tools in it!!) Thanks! I’ll put in for purple. Who could resist? I’d like a purple one. Thanks for the giveaway. A lovely shade of yellow would be nice and a timer would just be great as well. The purple is quite nice! I would LOVE red or orange! I heart Dramm. Ahhh, purple. How could you go wrong with royalty in the garden??? Count me in. Amazing! I’ve been very into purple lately, so that would be my pick! I am definitely prone to forgetting things I start, so a sprinkler timer would be fabulous. 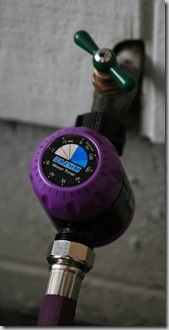 Definitely purple for the Turret Sprinkler and ColorStorm Timer. I’ll have everything in my garden purple if I can. I set my sprinkler up on an old metal stool. I use a couple of rocks or bricks to hold it in place. Soaker hoses are good in some ways, but the birds really appreciate sprinklers. They come flocking around for the water. I just make sure to water early or late so I don’t lose too much to evaporation. Maybe I should paint the stool to match my sprinkler. This looks like a brilliant idea! I could sure use one of these sets. The purple is lovely, but I’m a red all the way kind of gal. Thanks much for this chance to win. I love the look of the time. can it be purchased if I don’t win? Purple and/or green! Or blue. Orange! I think that the orange sprinkler would would show up so nicely in green foliage! I purchased an orange Dramm hose and have to say it is one of the best. It does kink sometimes but it is a lot more lighter in weight than the super heavy Sears non-kinkers. I still water by hand and enjoy the process, it gives me the chance to be in the garden every other day or more. The purple timer sounds intriguing, especially knowing that it does not have a battery and the price seems to be a great value. Would love to have one in my Dramm arsenal. Orange, please! Thanks for all the great giveaways, as well as the accompanying reviews. Thanks for the chance to win a PURPLE sprinkler and timer! I could use then during our extended drought here in Middle Tennessee. My garden has outgrown hand watering, but I haven’t put in any other system yet- time to change that soon. Colorwise, I’m all about blue. I have selectively overwatered for years. Save me blue sprinkler/timer! Purple would match the house trim-to-be. . .
I’d love to win this. And don’t kill me for saying this, but I’d take it in any color other than purple (running and hiding). I suppose red if I had to choose. And I could really use it to help deal with the drought we have going on (with no relent in sight). I would love green or yellow!! I would be so thrilled to get a yellow one – my plot in the community garden would so appreciate it! Blue, blue, blue. My husband would love me to have them, particularly the time. I would love these accessories. Thank you so much. These Dramm products are fabulous! Oh I love orange! What a fun giveaway! Ha! I know about the gardener’s distractions. Right now I am supposed to be weeding my veggie patch but I noticed one of my dahlias hadn’t come up so I had to come inside to read about planting depth and problem-solving and now here I am catching up on blog reading. Any color will do. Would love to have something like this for my backyard that dosen’t have a sprinkler system. It would be perfect. You lose track of time. I lose track of irrigation tools when I remove them from the hose temporarily. I would like a purple one. I’ll take green please (to match my new roof color). Thanks for writing these up. Super idea. I would love the blue color. I’m a sucker for orange. Ooh – cool! I’d love a blue one! Ah purple, easy to find. Som sort of camera or lighting tripod might work , or a PVC setup hmmm I see a project approaching. OOH! This would be perfect for me! I’m all about purple! Just found your blog and LOVE it! That sprinkler would work great for my upcoming vacation. Gotta love BLUE in the garden! Thank you so much for the giveaway. Green would be divine. Thanks! This is SO true, and made me laugh!! Nice post. With our current drought conditions these would be really helpful with getting the watering done! Let’s go green! I would LOVE the purple! I would love one of these, especially with the drought we are having! I think the purple is awesome! I think I’m a day late, but I just discovered your site and I love it! So if you haven’t given it away yet, I’d love a purple one! It will match my beloved Dramm watering wand and twisty spray-pattern-of-your-choice thingy that I use to spray aphids off my collards. Anyway, your site is beautiful and informative, and I look forward to my subsciption arrivals. Great work!